I have found and finished the first 2 levels. I am stuck trying to find level 3. I have found levels 4 and 5 but I really need to find level 3. I've played parts of levels 4 and 5 but can't finish level 3. How do I get back on the right sides of the dungeon to beat the boss? Where is the belly of level 3? Is there a boomerang? One room North of the Dodongo room has a passage that will take you to the area that has a key and the belly hint. There is also a bombable wall in that area where you can find a whistle. If you get the map 3 rooms north of Dodongos, the belly room will be apparent. There is a boomerang in Lv1. Edited by Flynn, 07 July 2018 - 08:39 PM. 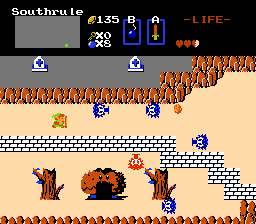 There's a clue if you push through a wall at the starting room of level 4. The south east room is reachable from a bomb through wall four rooms before the boss. Thank you again ZC Fan for the help. I finished level 5 but didn't find no ladder. Now I'm in search for level 6 but found level 7. This quest is hard and finding the items takes a lot of skills. I have died and saved so many times to keep from losing my keys. There is a boomerang in Lv1. Definitely missed this one, going back through and I can't seem to find it. Any ideas on where to look in the dungeon? Look in the room that has the most and most advanced boomerangers. Edited by Flynn, 10 July 2018 - 01:26 PM. I'm in lvl 3 and I need a key. I found the one near the Dodongo room and used it, but I can't seem to progress any further and I can't seem to locate the whistle. After taking that passage north of the Dodongos, besides a key there are two bombable walls in that area that will help. I finished level 8 before level 7. Is there a 3rd sword in the game? Can you give a hint to the maze? Yes, there is a 3rd sword. You need one of the two special items from Level 4 to get the location of the sword upgrade. One hint is at the waterfall, the other is in Level 2. Thanks again Flynn. I got the message. Is there a red candle in the game? Once again, can't find the item of the dungeon, this time in Level 2. Tried pushing against a lot of blocks in many rooms but I found nothing. Also seems like a waste to have 20 rupees behind a locked door, unless there was more there? Edit: Nevermind, didn't check the boss room properly lol.